They are crunchy, orange and tasty. They can come in many different shapes. They are cheese doodles, that we love. 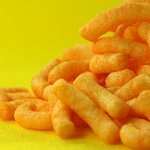 Celebrate National Cheese Doodle Day on March 5. About 15 million pounds of cheese doodles are produced in the USA every year. Doodles are made of cornmeal that has been puffed and baked. Cheesy flavor is given by coating doodles with cheddar cheese. If you don't like original curly shape of doodles, think of any modern variety: balls, animals and even other objects. There are strong debates about the invention of cheese doodles. One source says that they were invented by Morrie Yohai, former Marine, who took over the family business called Old London Foods after coming back home. Other sources claim that first doodles appeared in the 1930s and there were two competing accounts, one from New Orleans and one from Wisconsin. No matter when and who invented cheese doodles, they are here. They are orange, crunchy, flavorful and tasty. Grab a pack of your favorite cheese doodles to share with your friends and celebrate National Cheese Doodle Day.